It floods somewhere in the United States or its territories nearly every day of the year. In the past 30 years, floods have claimed an average of 94 lives a year and the economic impacts of floods are growing. The annual average inflation-adjusted direct damage costs due to flooding have risen each of the past three decades from $4.7 billion for 1981-1990, to $7.9 billion for 1991-2000, to $10.2 billion for 2001-2010. The goals of Flood Safety Awareness Week are to inform the public about NWS forecast and warning services and flood safety information, heighten public awareness to the risks associated with all types of floods including flash flooding, storm surge, and those related to dam or levee failures, and empower citizens to take actions necessary to protect their lives and property. 2011 was a devastating year for flooding impacts and provided a clear example of why Americans depend on multi-agency water resource services like flood forecasts and warnings issued by the NWS, water observations provided by the USGS, water control and management provided by the U.S. Army Corps of Engineers, and the Federal Emergency Management Agency's efforts in flood preparedness and response. At any time, heavy rainfall or rapid snow melt can lead to flooding. Each geographic region of the United States has one or more times of the year with an increased risk of flooding. In the late fall and winter, powerful Pacific storms can strike the West Coast causing extensive flooding. From late winter into spring, people living across the northern third of the nation closely monitor NWS forecasts when snow and ice can melt quickly, potentially causing ice jams and extensive river flooding. In the spring and summer, the threat of a flash flood from a thunderstorm is always a possibility almost anywhere in the country. Each summer and fall, millions of people living near the Gulf and East coasts listen keenly to tropical weather reports to determine if flooding from a tropical storm or hurricane will impact their area. As our nation's infrastructure ages, increased stresses on dams and levees due to the seasonal impacts described above can heighten flood threats. Regardless of the cause, the NWS is committed to improving the timeliness and accuracy of river and flood forecasts and warnings necessary to help protect lives and livelihoods. Water resources decision makers require new and more integrated information and services to adapt to the uncertainty of future climate, land-use changes, an aging water delivery infrastructure, and an increasing demand on limited resources. Dr. Thomas Graziano, Chief of the NWS Hydrologic Services Division, stated; To address these growing challenges and to mitigate the death and destruction caused by floods, NOAA, the U.S. Army Corps of Engineers, and the U.S. Geological Survey, with complementary missions in water science, observation, prediction and management, have formed a partnership entitled Integrated Water Resources Science and Services (IWRSS) to address the nation's water resources information and management needs. In May 2011, this partnership was formalized through a Memorandum of Understanding signed by the three agencies. On February 21, 2012, NOAA commenced the official groundbreaking of the new National Water Center (NWC) on the campus of the University of Alabama in Tuscaloosa. Gary Carter, Director of the NWS Office of Hydrologic Development, stated, The NWC will create a first-of-its-kind national center for water forecast operations, research and interagency coordination and serve as a catalyst for IWRSS. It will support the routine generation of enhanced water resources forecasts and information to more effectively manage the Nation's increasingly limited water supply and facilitate adaptive planning and management. The NWC will be ready for initial occupation in late fiscal year 2013 and will be staffed by multiple federal partner water agencies to ensure strong coordination and collaboration. Detailed information can be found on this Web page about important topics covered in the following paragraphs. The Advanced Hydrologic Prediction Service (AHPS) is the NWS frontline solution for providing improved river and flood forecasting and water information across America. AHPS provides a suite of graphical and numeric products over the Internet to assist the public, community leaders and emergency managers in making better life- and cost-saving decisions about evacuations and movement of property before flooding occurs. The broad reach of AHPS extends the range of forecasts from short-term (up to 6 hours) to long-term (out to weeks and months). AHPS provides the public with more detailed and accurate answers to the following questions: How high will the river rise? When will the river reach its peak? Where will the flooding occur? How long will the flood last? How long will the drought continue? How certain is the forecast? Most flood-related deaths occur in motor vehicles when people attempt to drive through flooded roadways. Don't underestimate the power of flowing water across a road. 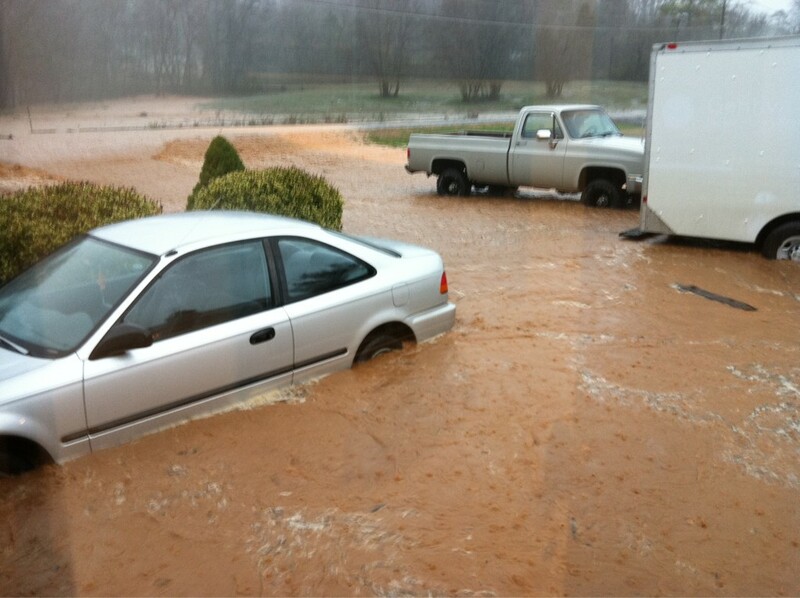 It only takes 12 to 18 inches of water to cause a vehicle, even large SUVs, to float. Unknown to the driver, the road may even be washed away under the surface of the water, allowing the vehicle to be swept away with the flood current. The NWS has developed the flood safety slogan: Turn Around Don't Drown and hopes you will remember these words when you're faced with a flooded roadway and have an important decision to make. Be especially cautious when driving at night when it is harder to recognize flood dangers. Floods, Droughts, and Other Related Phenomena.